ScopeAI integrates directly with Segment to import your user data and activity and connect it with your user conversations. ScopeAI collect all your Segment identifies, pages, and track events allowing you to filter conversations by these attributes and creating analysis based on these attributes; analysis can be seen under the 'Analysis' tab on any search, more information on that here. Name: Give your integration a unique name; this is the name the connection will display within ScopeAI. 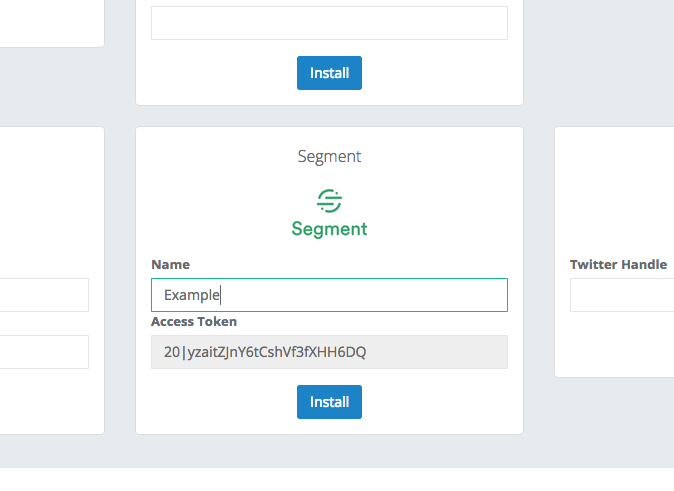 Access Token: This is an automatically generated ScopeAI API Key which you will use to configure your ScopeAI destination in Segment. Copy the Access Token and place it somewhere for safekeeping, you will need it for Step 2. Click on Install. Search for “ScopeAI” within the Destinations Catalog and confirm the Source you’d like to connect to. Drop in the Access Token you copied over from Step 2 into the “API Key” section of the Segment Settings UI. If you don't have your Access Token readily available simply click on 'Show Token' under the Segment integration you've created to see it. After you've created your Segment + ScopeAI integration, we'll begin ingesting your user data. To be able to see and filter by your user data, the data must be tied to conversations from that user. ScopeAI will automatically tie your user conversations to your user data but you will need to setup an integration to import your conversations with your users. User conversations cannot currently be imported through Segment. If you haven't already, find your help desk integration under the Integrations tab and configure it so that ScopeAI can begin importing your conversations. If you do not find your integration under the New Integrations page, please do not hesitate to reach out.